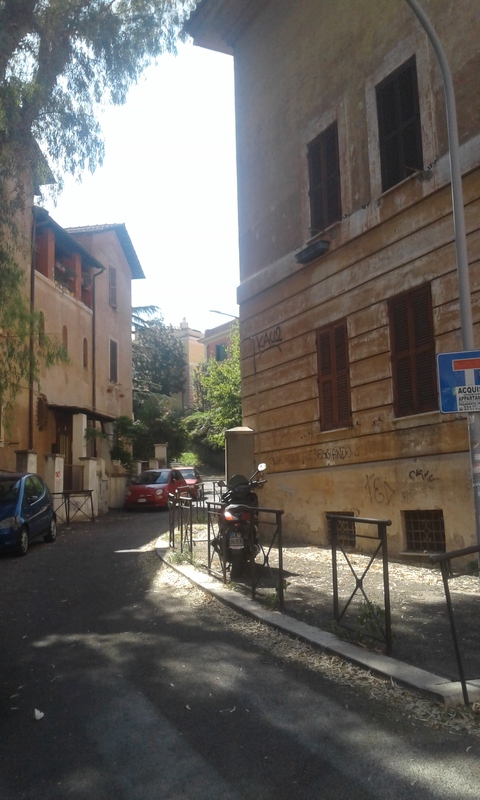 It is very strange, being back in Rome for a few weeks. Being slightly cold most of the time, taking the bus, brushing your teeth in tap water, having a hot bath. How cheap food is, especially cheese and celery. Horse meat in the supermarket, not goat. Not hearing chickens at dawn. Still being a badly dressed foreigner (a straniera, an obruni). Seeing so many friends and neighbours, who exclaim: “You’re BACK!” Explaining that the move is pending, that in 19 days I head back to Accra, and wanting to make the most of it while we are here. Enjoying the food: the coffee, fresh pasta, Roman pizza. The thrill of seeing prepped puntarelle. Rome is amazing. Not that Accra is terrible, by all means. There was a Garbatella street run today, so the police had closed the piazza and we could hear the loudspeakers and see runners meandering through. Here, the kiddie section is passing by. Last Sunday I baked bread, reveling in being cool enough to knead dough comfortably. I made helkornbrød, whole cracked wheat bread using the cracked wheat packet recipe. Today I made it again, halving the amount of fresh yeast and adding rye flakes. * This should be mixed and soaked overnight – this time I did that. Then added to dough with water and yeast next day. Mix ingredients, knead 4-7 minutes. Cover and leave to rise until pillowy, and dough is doubled in size, a couple hours in a cool kitchen, bowl covered with a hotel shower cap. Fold dough for a few minutes in the bowl with a spatula, it helps the structure. Shape and split dough between two loaf tins. Leave to rise an hour or so, then bake at 225C on lower shelf in oven for 45 min. I slashed these slightly right before baking. If you take it out of tin, and tap base, it should sound hollow. Take out of loaf tins and cool on rack before slicing. I was a bit overwhelmed by the supermarket selection today: ricotta, mascarpone, broccolo romano, pecorino cheese with truffle…… So much I have missed, and now I hardly know where to start. But yes, I bought puntarelle, and anchovy fillets in oil, so that will be a lovely puntarelle salad tomorrow night. Maybe with this bread. This entry was posted in baking, food, Rome and tagged bread, living in Rome on November 26, 2017 by krumkaker. The Lucifer heatwave is still in force, too hot to do much. Quiet streets, 37.6C right now but not yet passing the 2003 record of 40.6C. 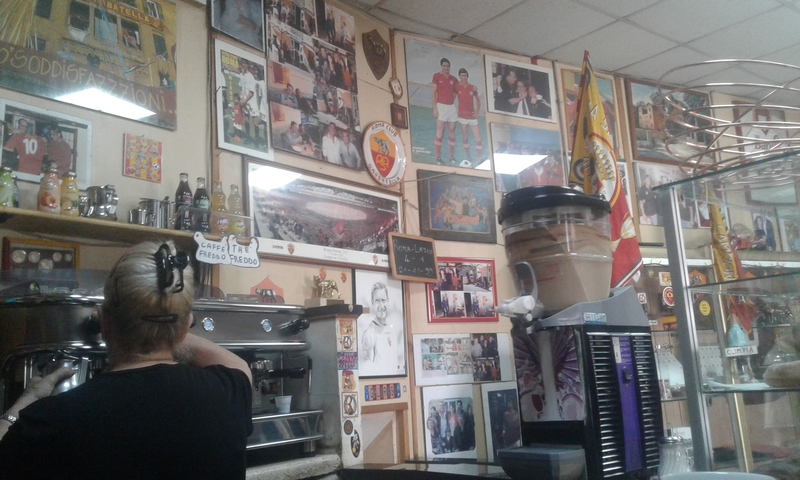 Caffe freddo at the Bar dei Cesaroni up the hill, a Roma stronghold. Nero the parrot is still there. Good that things do not change too much here! Photo from January when it was MUCH colder. 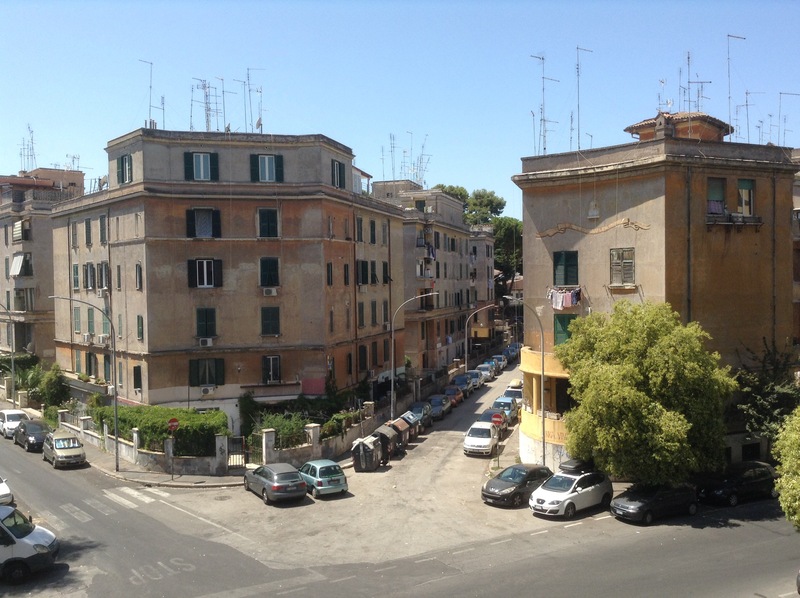 This entry was posted in Rome, travel and tagged Garbatella, summer on August 9, 2017 by krumkaker.